Tilla asks: Why is it that people are much taller now than even a few decades ago? Over the last century and a half or so, humans, as a group, have grown significantly taller, with men from western, industrialized countries today being on average between 3 and 7 inches (7-18 cm) taller than their counterparts in the mid-19th century. So why have humans gotten taller? There is very strong evidence that this simply comes down to nutrition and the body’s ability to fully benefit from said nutrition via not getting certain diseases that hinder the absorption of consumed nutrients. That the environment is drastically more important than other factors, such as microevolution, is strongly indicated via looking at human height during times of relative comfort compared with times of strife. For example, examination of skeletons over human history has shown that, while there have been peaks and valleys of average height across different cultures at different times, from the Stone Age through the beginning of the 19th century there has been little significant difference in average human height on the whole. As for the peaks and valleys, during the Black Death (1346-1353), 60% of the European population, about 50 million people, died quite suddenly, leaving the surviving 40% and their offspring with greater access to food and less crowded living conditions; together, this contributed to fewer diseases and better nutrition, and as a result, people during the 15th and 16th centuries in Europe grew rather tall. In fact, in England, the average man was only about 1.5 inches (3.81 cm) shorter during this time compared with the average Englishman today (at about 5’9″ or 175 cm). While many people think Napoleon was short, by the standards and region of his day, he was actually above average in height. The myth that he was short stems primarily from the fact that he is listed as 5 feet 2 inches tall at the time of his death. However, this is 5 feet 2 inches in French units. In modern international units, he was just shy of 5 feet 7 inches, or about two inches shorter than the average American male today. For reference, at the time in France, the average height for an adult male was about 5 feet 5 inches in modern international units. The world isn’t just catching up with America on height, it’s gaining weight with us as well. In 2014, it is estimated that 39% of adults, worldwide, were overweight, and 13%, or about 600 million, were obese. Note that these percentages are still far shy of the whopping 70.7% of American adults who are at least overweight and 37.9% who are obese. Interestingly, while most people stop growing around the age of 20, it has been observed that certain malnourished communities tend to see their members continuing to grow in height throughout their twenties, though their ultimate height is still much shorter than communities where people have access to better nutrition and stop growing around 20. Historically, the taller you were, the longer you’d live. This is generally thought to be because, as noted, taller people tended to be better nourished and have avoided certain diseases. Beyond avoiding diseases, proper nutrition also allows the body to handle disease better, as well as adequate nutrition putting less stress on the body in general. Why are people taller today than yesterday? Why have American stopped growing taller? 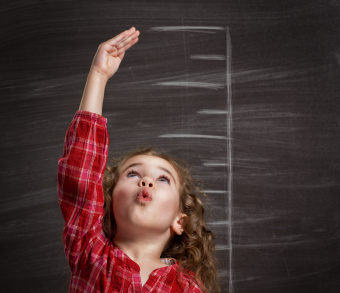 Will humans keep getting taller? Dairy consumption and female height growth: prospective cohort study. I have no doubt that these two factors have contributed greatly to the marked decline in average height in the U.S. since 1980. Upon further reflection, I want to withdraw my uncharitable characterization (“unpersuasive political propaganda”) of the author’s positive reference to “universal health coverage and other social policies” — provided she did not intend to applaud “socialized medicine” (which has been disastrous in some nations). Having “universal health coverage” is a worthy goal, provided that (1) it is not forced on citizens that do not want it … and provided that (2) it is not managed by a socialist federal government. I agree with both your posts whole-heartedly, I think the logic behind both makes sense. Also, I came across an interesting counterpoint to this article (http://hubpages.com/education/Myths-and-misconceptions-about-history-people-were-shorter-back-then). 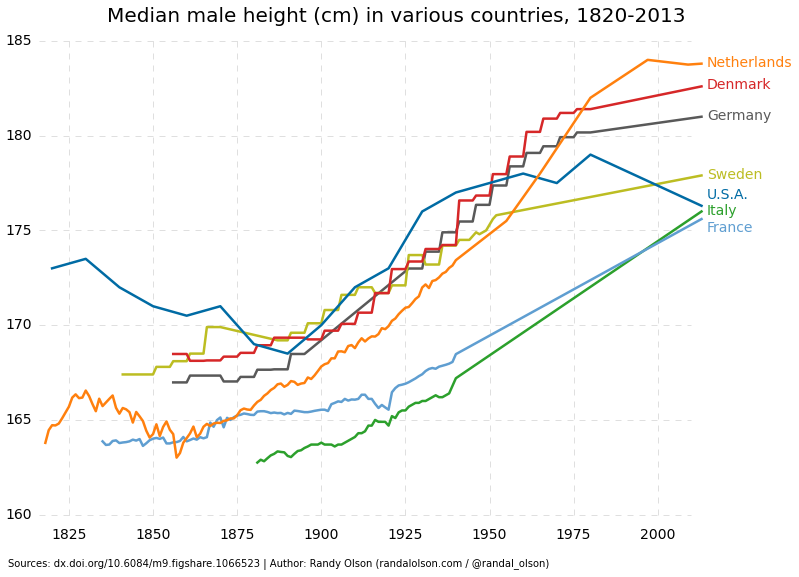 It makes an argument essentially that height has increased, but not nearly as much as people might think. 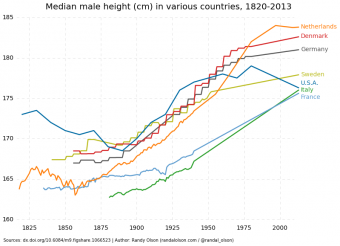 My take is that I think height probably has increased a few inches in western countries the last few hundred years. But one good take away that made sense was in the comments of the above site. How often do you hear people say “look how low the doorways and ceilings are on these old houses, think about how short people used to be!”? You go around a lot of old houses in New York, Boston, etc. and it seems to make sense, until you realize it was more to do with the weather. Shorter ceilings and doorways retains heat better in the North, but if you go to Charleston or Savannah you will find 12-18 foot ceilings because it was hotter and heat rises (obviously not because giants lived there). I would like to see a comparison of ceiling heights in residential dwellings between northern and southern homes owned by people of comparable economic status. I suspect the differences noted have as much to do with the ability of some to afford homes with 12 to 18 foot ceilings as with climate. This statement is attributed to what source(s)? All current records for human longevity indicate that the reverse is true.